The Sitka black-tailed deer (Odocoileus hemionus sitkensis) is native to the wet coastal rainforests of Southeast Alaska and north-coastal British Columbia. Its range has expanded via transplants, and established populations now exist near Yakutat, in Prince William Sound, and on Kodiak and Afognak islands. Related to mule deer, Sitka black-tailed deer are smaller and stockier than the Columbian black-tailed deer found in the Pacific Northwest. The average October live weight of adult Sitka black-tails is about 80 lbs (36 kg) for does and 120 lbs (54.5 kg) for bucks, although 200-lb bucks have been taken. The dressed weight of a 100-lb (45-kg) deer is about 60 lbs (27 kg), yielding about 35 lbs (16 kg) of meat. 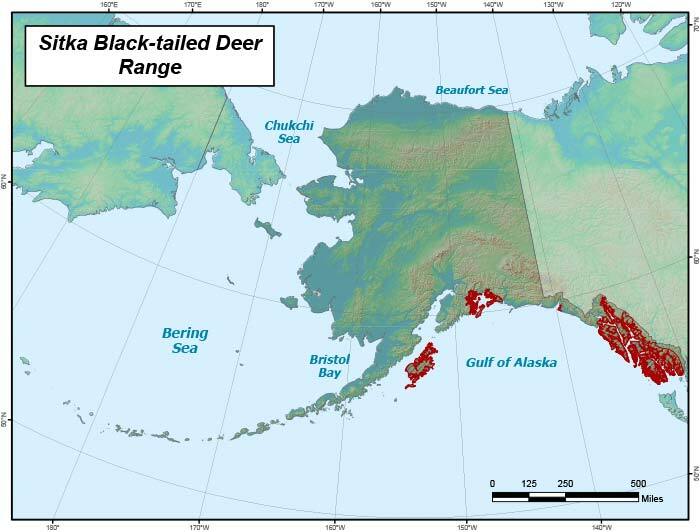 Deer populations in Alaska are dynamic and fluctuate considerably with the severity of the winters. When winters are mild, deer numbers generally increase. Periodically, however, a severe winter will cause a major decline in the population. Deer have a high reproductive potential, and reduced populations normally recover rapidly. In some cases, predation may accelerate a decline in deer numbers, or slow recovery to higher levels. In Southeast Alaska, the Sitka black-tailed deer is the most frequently pursued species of big game. Between 1987 and 2007, an average annual harvest of about 12,330 deer has occurred in Alaska. Early season hunting is concentrated in the alpine and subalpine areas. The largest portion of the harvest happens in November during the rut, when both sexes respond to a call resembling the bleat of a fawn. During late November and December, heavy snow sometimes concentrates deer at low elevations. This allows high harvest levels when local weather conditions are favorable. Throughout winter and early spring, deer are generally restricted to uneven-aged old-growth forest below 1,500 ft (366 m) in elevation. The old-growth forest provides optimal winter habitat because the high broken canopy intercepts much snow but still provides enough light for the growth of forage plants used by deer. During winter, the distribution of deer at various elevations is influenced by changing snow depth. During extreme snow accumulation, many deer congregate in heavily timbered stands at lower elevations. Some may even move onto the beach. Spring is a critical period for deer, and if winter snows are deep and persistent many deer starve to death. As snow melts in mid- to late spring deer begin to disperse, and by late spring and early summer they start rebuilding some of the fat reserves lost during winter. See more information and a diagram showing the annual cycle of a migratory Southeast Alaska deer. Summer and winter home range areas vary from 30 to 1,200 acres (12 – 486 hectares) per deer. Migratory deer have larger annual home ranges than resident deer. The average distance between summer and winter home ranges is five miles for migratory deer and half a mile for resident deer. Movement of deer between watersheds appears to be minimal during winter. During summer, deer generally feed on herbaceous vegetation and the green leaves of shrubs. During winter, they are restricted to evergreen forbs and woody browse. When snow is not a problem, they prefer evergreen forbs such as bunchberry and trailing bramble are preferred. During periods of deep snow, deer use woody browse such as blueberry, yellow cedar and hemlock, and arboreal lichens. Woody browse alone, however, is not an adequate diet and deer rapidly deplete their energy reserves when restricted to such forage.